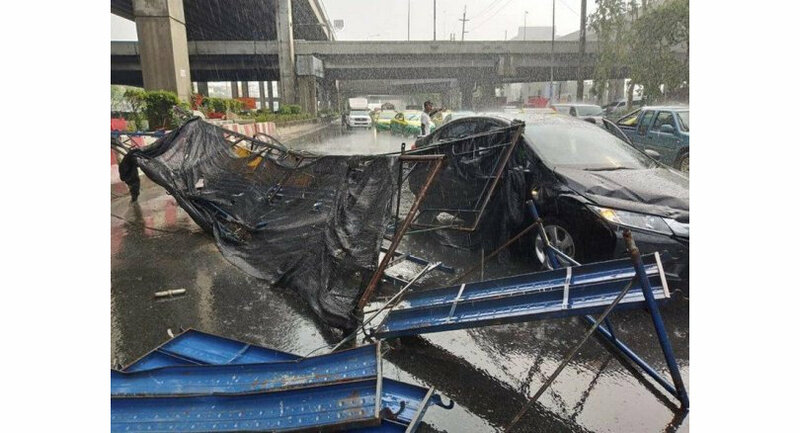 The Thai Meteorological Department had previously warned about storms, gusty winds, hail stones and lightening in upper Thailand from March 23-25 and warned people to avoid open fields, big trees or billboards during the storms. That's only because your personality took over. I heard thunder for about 10 mins, but it was gloriously sunny outside. Not a dark cloud in sight. Never experienced that here before. Awwww That's sweet but no, again, I'm not going up to CM to check out your "special" room, so no need to butter me up. Perish the thought. I only eat margarine, because it's healthier. With v.
The "special" room is equipped with a straitjacket for rambunctious guests. 'Avoid billboards' how the fg hell ya gonna do that!!! I'm going to ask my girlfriend if she will dress up like a bunny for me during the next one. w﻿arned people to avoid open fields, big trees or billboards during the storms. Until the election is over avoiding billboards is impossible. I hope, starting Monday, that there is a concentrated effort to remove all the eyesores, (and vision blockers), polluting the roadsides. Heard all the thunder in the distance, but not a whiff of breeze nor drop of rain in out part of BKK. I asked why the odd name, she replied b'cos she spread easy ! Brando would've turned her down. In Last Tango in Paris, he professed to be a butter man.